Looking for an impressive side dish for your dinner table? A colorful and flavor-packed Balsamic Roasted Brussels Sprouts Salad like this can easily become the star of the menu. Although it looks and sounds sophisticated, it’s one of the easiest side dishes. Ready in about 30 minutes. If you think side dishes are as important as the main dish or the dessert on a special dinner menu, this recipe is for you. Normally, I don’t spend much time on planning or making a side dish and just go with a simple green salad or a classic Chopped Turkish Salad. On the other hand, if it’s a special dinner party with friends, I try to be a bit more creative on side dishes. You know what? We almost never have any leftovers of the side dishes whose role is just to accompany the main one. Yep, this Balsamic Roasted Brussels Sprouts Salad is one of those dishes. Before moving on to the recipe, I must tell you that I’m not a brussels sprouts fan. I love their cute shape more than their taste and I think they need some special interest to result in something tasty. I do love vegetables, but these little cabbages are not close to my love of zucchini or cauliflower. Oh have you seen my latest favorite cauliflower recipe, Roasted Curried Cauliflower Salad? You need to stop here and just go see that uber tasty recipe. Just sayin’. Don’t forget to come back though for this colorful and beautiful salad. Balsamic roasted brussels sprouts are perfect to combine with some fall and winter fruit like persimmon, orange and pomegranates. 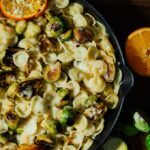 I used them all in this recipe and their flavors match perfectly with brussels sprouts. Besides all the fresh flavors, I used a little chopped sun-dried tomatoes and I think this small touch complements the salad wonderfully. Pick smaller sprouts; not only because they look cuter but also they are firmer and taste better. You might still need to remove the outer leaves if they don’t look good. Don’t leave them whole unless they are tiny. Roast them halved so that they absorb the tangy flavor of balsamic vinegar better. First, roast the halved brussels sprouts placing them cut-side down and then flip them over after 15 minutes so that both sides are equally tender. If you want to go with a non-vegetarian salad, jazz it up with bits of bacon. 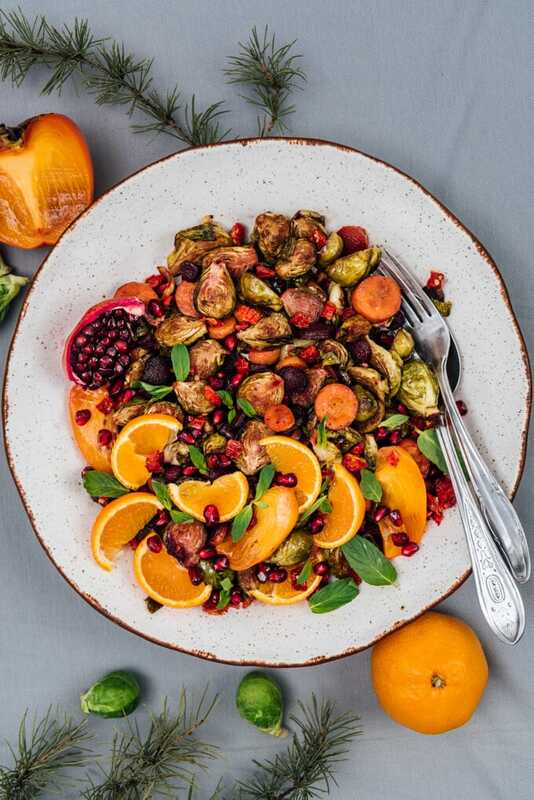 Balsamic roasted brussels sprouts and carrots combine with some fresh fruit and turn out to be one of the tastiest side dishes. Place the halved brussels sprouts and carrots on the baking sheet. Drizzle with olive oil, half of the balsamic vinegar and salt. Using a spoon, toss them well. Make sure the brussels sprouts are cut-side down and in a single layer. Bake for 15 minutes or until they get light brown. Remove from oven, flip brussels sprouts and carrots over. Bake for another 10-15 minutes or until the cut-sides look nicely charred. In a large bowl, whisk together the rest of the balsamic and lemon juice. 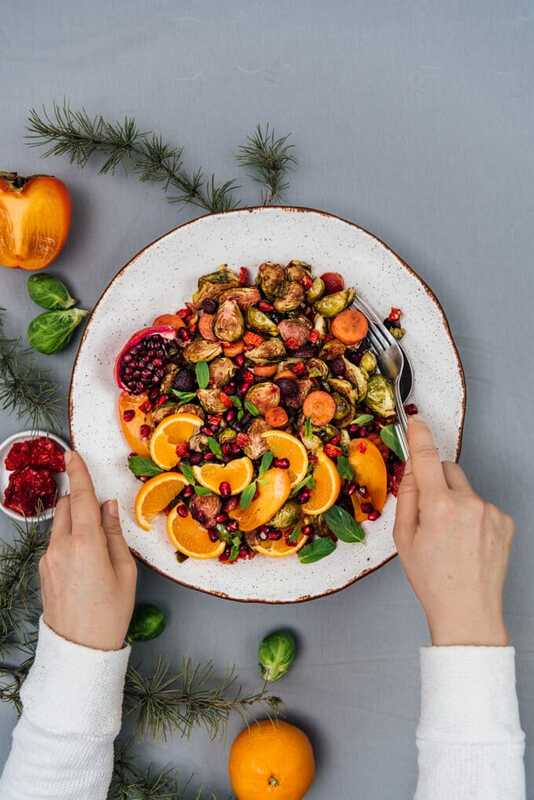 Toss with roasted sprouts, carrots, chopped sun-dried tomatoes and pomegranate arils. Taste and add more salt if needed. Top with sliced persimmon and clementine. Garnish with fresh mint sprigs and serve. Soak sun-dried tomatoes in hot water for 5 minutes and then chop.